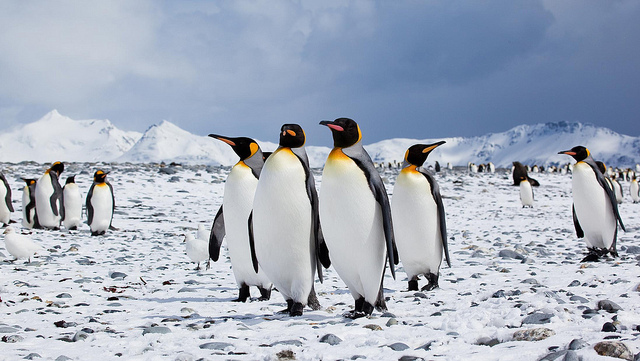 Penguin patrol: undercover insight to population changes in a warming Antarctic climate. For many wildlife enthusiasts, penguins stand out as one the most majestic species to inhabit Antarctic environments. Adélie, emperor, king, gentoo, and chinstrap penguins native to the southernmost continent are increasingly popular birds of study for population ecologists and climate scientists. As a predator near the top of most Antarctic food webs, penguins offer invaluable insight to science because of their integral dependence on sea ice. Insufficient sea ice = Lost breeding ground & less food. Penguins require stable sea ice along the coastline to lay their eggs and rear their chicks. Warming winter temperatures and stronger winds have complicated the breeding cycle for many penguin colonies due to the risks of raising young on thinner sea ice. Higher temperatures also raise the moisture content of the air, promoting snowier conditions. Proximity to land devoid of snow or ice cover is a necessity for Adélie penguins to raise their young. Shrimp-like krill are also a major staple for penguins, along with other crustaceans, including fish and squid. A decline in coastal sea ice adversely affects their primary food source since krill flourish in water beneath the ice. For a species so sensitive to fluctuations in sea ice, the repercussions of climate change are plenty. Acknowledging the need to better understand the health and adaptive behaviours of penguins, a promising innovation out of the University of Strasbourg (France) has recently arrived to take a few steps closer to life in penguin colonies. Camouflaged rovers = Undisturbed penguin colonies = Authentic data collection! In Terre Adélie, a region of Antarctica claimed by France, there is a new penguin in the colony. This one an electronic equivalent, bred by Yvon Le Maho and colleagues. These French scientists designed two rovers disguised as juvenile and adult emperor penguins and introduced them to a real colony as a new approach of studying the iconic species. While most species of penguins are known for their highly social behaviour—leading to their congregation in colonies—the presence of humans on their territory dramatically raises alarm. Previous methods of monitoring penguin populations include capturing and tagging them. Aside from the initial stress of interacting with the birds, this approach is further limited by the need to get an antenna within a meter of the penguins in order to transmit collected data. Sending emperor penguins back into their colonies post-tagging also provokes dispute among penguins that may cross another’s territory. Le Maho’s work reveals that nearly half of experimental subjects (adult emperor penguins) did not appear distressed when confronted with an uncamouflaged rover, while 25% showed signs of curiosity. Only 28% reacted anxiously. In response to an approaching human, the heart rate of penguins was four times faster than when they encountered a rover. Taking the experiment a step further, disguising a camera-on-wheels as a realistic member of the family and remotely ‘waddling’ into the colony proved to be a strategy penguins were far more receptive to. Implementing disguised penguins even sparked communication by adults to the rovers! In short, this has wonderful implications as a non-intrusive way of getting up close and personal to a shy, easily threatened species. The historical record speaks volumes on the interdependence of penguins and sea ice, which is why rover penguins are an exciting novelty in assessing health and behavioural trends. An uncharacteristic warming event led to a 10% decline in Antarctic sea ice during the 1970s, desecrating half of the continent’s emperor penguin population. (A fortunate re-cooling in the early ‘80s led to resurgence of the population). The future looks grave for the ambassadors of the Antarctic if warming trends become the norm. Breakup of sea ice can potentially wipe out colonies of Adélie penguins in Terre Adélie; some of these colonies have already plummeted by 90%. Director-General Jame Leape of the WWF International asserted that, “The food web of Antarctica, and thus the survival of penguins and many other species, is bound up in the future of sea ice”. While an aggressive effort is necessary to mitigate the causes of melting sea ice, using remote-control rovers to expand our knowledge of penguin population dynamics in a safer, undisruptive manner makes it a technology worth endorsing.